By Libya Herald Staff reporter. In what is seen as a warning to the Tebu community not to cause trouble, two bombs are reported to have been dropped on the remote south eastern Tebu oasis of Rebyana this morning. A light border reconnaissance aircraft based at Kufra is said to have been used. The bombs are reported to have fallen on the outskirts of the oasis causing no damage or casualties. Reacting to the attack, the National Tebu Assembly described it as ”henoius crime” and ethnic cleansing, and pledged to ensure that those responsible were charged by the International Criminal Court. 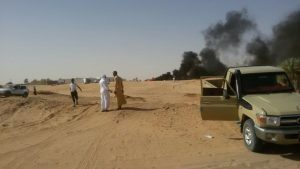 The incident follows a warning from Kufra military zone commander Al-Mabrouk Al-Gazwi and the military mayor appointed by Abdul Razzaq Al-Nazhouri that any breach of the law on the main road from Kufra heading north and at the town’s airport would not be tolerated. Specifically Al-Gazwi told the town’s Tebu council of elders that any violations of the law or the road or at the airport by members of the community would be punished. The airport, closed a year ago by Tebus after a Tebu student was kidnapped allegedly by Zwai airport guards, was officially reopened on Saturday. Its director has been reported saying that the first flight would be today, from Tripoli. However, no flight to Kufra is on Mitiga Airport’s online arrivals and departures board. Local Tebus have been aligned with the Libyan National Army (LNA) and Khalifa Hafter while the majority community in the town, the Zwai, were previously sympathetic to the defunct Libya Dawn alliance. The local Tebu view now is that they are under threat from the LNA’s Al-Ghazwi. The 4,000 population of the remote and relatively small Rebyana oasis, consists entirely of Tebus. The Libya Herald was unable to contact a spokesman in the oasis because of poor communications facilities there.